Jane Goll, who conceived and established Westminster School, was herself the product of a remarkable upbringing. Her intellect, discipline, and dedication to learning were nurtured and strengthened by the richness and rigor of a traditional, classical education in the New York City public schools, as well as the close attention and high expectations of her father. Her great sympathy for humanity and her passion for living were inspired by literature and a wide array of cultural and life experiences provided first by her parents and then through her own choices. Mrs. Goll grew up aspiring to be a teacher. She married and accompanied her husband to various governmental posts in Europe, where she experienced firsthand the educational systems practiced there. When Mrs. Goll returned to America, teaching in both public and private institutions, she felt that the schools neither challenged nor enriched the students as much as they deserved, so she decided to establish her own school. In 1962, Mrs. Goll rented facilities at St. Albans Episcopal Church in Annandale, VA, and opened a private kindergarten class. The children in her care made such remarkable progress that their parents pleaded with Mrs. Goll to expand the program into first grade. Year by year, the program grew, and soon Mrs. Goll needed to give her school a name. Inspired by the great English school of the same name, Mrs. Goll chose to call the school Westminster. Into her vision of a superior elementary education, Mrs. Goll wove the English dedication to classical learning; the high expectations and attention to detail emphasized in German schools; the passion for philosophical inquiry, emphasis on the arts, and the joie de vivre of the French; and the optimism, warmth, and friendliness characteristic of American schools. From these hybrid elements, fed by the passion and dedication of Mrs. Goll, her protégé, Mr. Glover (the current Head of School), and other supporters, grew the structure of Westminster, its program, policies, procedures, traditions, and values. In establishing the Western Civilization survey and classical studies as the touchstone of the curriculum, Mrs. Goll was particularly influenced by the writings of Gilbert Hyatt and Jacques Barzun. From Hyatt, she also borrowed the correlation of the sequence of the history curriculum with the particular age and developmental stage of the students. 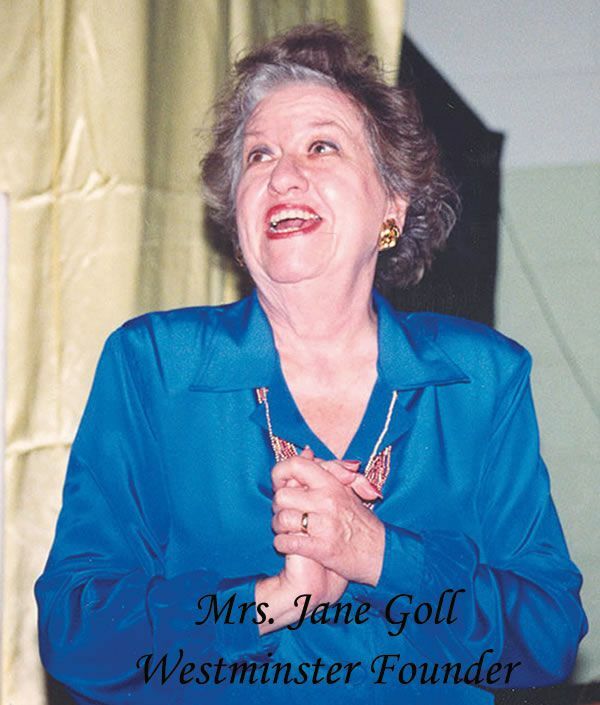 Mrs. Goll’s intense vitality, charm, and strength of character earned her much love and respect, and her death on September 5, 1992, came as a sorrowful shock to the Westminster community. At her memorial service, more than 300 staff members, students, parents, alumni, and friends joined family members in celebrating her dauntless spirit and significant accomplishments. Westminster’s philosophy expanded under the leadership of the school’s second (and current) Head, who was personally and professionally mentored by the school's founder. Mr. Glover’s personal upbringing manifested itself in an overall emphasis on striving for excellence, showing pride in work and attention to matters of presentation, whether personal or in the physical plant. His education in the humanities, with an emphasis on classical learning, dovetailed with the program established by Mrs. Goll, but he brought additional interests and energy to the school. Mr. Glover was instrumental in developing the P.E. and athletic programs, including helping to found the Capital Athletic Conference and insisting on league parity for girls. His work with the students in drama and other hands-on teaching, along with his personal evolution, persuaded him of the central role of the arts in the development of the individual. While exposure to the arts had always been included in the Westminster program, the powerful effect of participation in the arts on the children’s confidence, poise, and sense of possibility gradually emerged as a highly desirable and defining characteristic of the Westminster program. 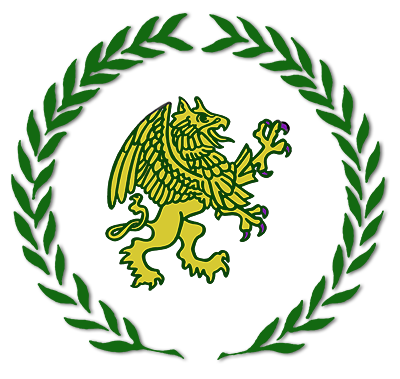 This development of both athletics and arts as important components of a Westminster education, in addition to the strong academic program, gave rise to the ideal of a Westminster graduate as a “Renaissance” person, knowledgeable, interested, and actively engaged in developing him/herself in many directions. From this arose a school motto: “Celebrate strength, strengthen weakness.” In other words, rather than focus on one outstanding ability a child may evidence, the Westminster program provides opportunities to “shine” in areas of strength, while nurturing and challenging the student in many areas. The goal of balancing the energies and development of mind, body, and spirit emerged in the school philosophy. Having reached the milestone of its 50th anniversary (in 2011-2012), Westminster's goal is to preserve the essential mission and philosophy of Westminster School, while actively evolving the program to meet the needs of 21st-century children and their parents. It is an exciting time for Westminster School, as it gazes toward the next half-century and ever-expanding horizons. 1962-1971 - Westminster School is housed at St. Albans Church on Columbia Pike in Annandale. The school began with grades K-2 and over time, expanded to include grades 3-8. 1971 - Westminster School opens at 3819 Gallows Road with 14 classrooms and an office. What is now the back hall of the school was the main hallway. Classes are also held in the Stone House. The Stone House also houses the library during this time. 1973 - A two-classroom addition is added. 1976 - Mr. Glover becomes Mrs. Goll’s assistant. The drama program is launched with the first play "The Emperor’s New Clothes" performed by 4th grade. 1978 - The gym is built. 1979 - The CAC (Capital Athletic Conference) is created. Westminster is a founding member. 1981 - The colonnade, the skylight corridor, new office spaces, and five new classrooms are added. 1985 - The “blue wing’ is added, which houses new spaces for music, art and the library. 1991 - The Griffin Window, in honor of Mrs. Goll, is created by Dr. Russell Libby. 1992 - Mrs. Goll passes away. 2002 - Groundbreaking on the Jane Goll Center for the Arts. 2003 - The Jane Goll Center for the Arts Opens. 2005 - The Shakespeare windows are installed in the Skylight Corridor. 2006 - Mr. Glover celebrates 30 years of service to Westminster School. 2007 - The garden area in front of the school is completed. 2009 - Two acres of land are acquired to build a new synthetic field. Click here to help support the effort to bring new athletic space to Westminster School. 2010 - The Griffin Academy Preschool is established and opens its doors at 6800 Columbia Pike, Annandale, VA.
2012 - Mr. Goll passes away.